BMX Challenge is a fun game in which you will have to control this bike through the different circuits while doing amazing pirouettes with which to add points to your marker. You will have to take advantage of the ramps to take height and do acrobatics on top of the BMX bike. You have to reach the objective score to complete the level and be able to move on to the next one, where a much greater challenge than the previous one awaits you. Use the arrows of the direction cursor to manage the bicycle and the spacebar to jump and gain more momentum in the jump. The X and C keys will help you do the acrobatics in the air with which you can earn points and reach the objective. 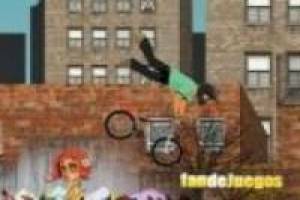 Show your skill with BMX bikes in this fantastic game. Enjoy the game BMX challenge, it's free, it's one of our bikes games we've selected.